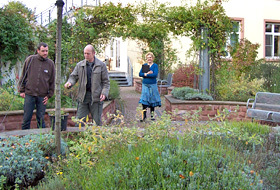 Peter Vaughan (centre), the man with the idea, together with his assistant and Marion Weber from the press office in the middle of the original roof garden at the Buergerhospital, as it was in 2001. Floradrain® FD 60 was installed across the entire area beneath the stone walls, walkways and of course beneath the subsequent plants. This ensures water run-off across the entire area. The system substrate "Roof garden" was blown onto the roof area using a silo vehicle. The exhaust air pipes are purposely installed in the raised beds so that they can be hidden from sight by the climbing roses. 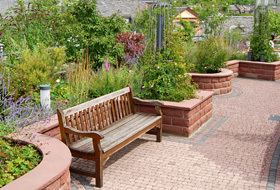 The geometric lines of the stone walls provide a border for the raised beds and shows nature at your fingertips. The garden has been returned to its former glory after the two storeys were added to the building in 2008 and the roof garden was re-instated. The many seating elements along the walkway invite the visitor to linger a while. 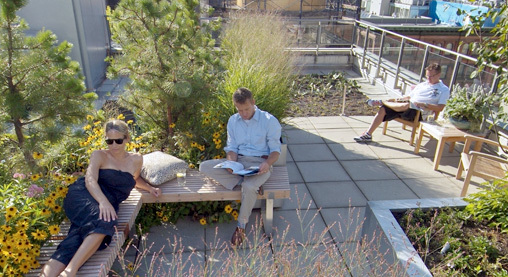 A roof garden where patients can relax and convalesce. 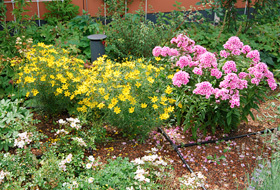 Thanks to the ZinCo system build-up and drip line irrigation system, the Coreopsis (yellow), Phlox (purple) and other roof plants are in full bloom. The Buergerhospital is in the densely-populated district of Nordend-West of Frankfurt (Germany). 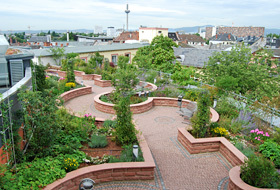 Due to the lack of green space on the ground, a roof garden in full bloom has enhanced the Buergerhospital for over ten years now and across an area of about 750 m². Patients and visitors appreciate this appealing relaxation zone on high just as much as the medical and other staff. As a result, when the building had to be extended in 2008 by adding two storeys, the roof garden was completely dismantled and reinstalled two storeys up in the same design and using the same ZinCo technique. The roof garden has now returned to its former glory. The Buergerhospital values a holistic approach in its health care and nursing. The important thing is the wellbeing of the people involved and the design and structure of their environment play a vital role here. The sculptor and landscape gardener, Peter Vaughan who is based in Friedrichsdorf has been involved with the Buergerhospital for over 20 years now. He is responsible for all green spaces at the hospital both indoors and outdoors. He also often leaves an enduring mark in the form of sculptures and pieces of art. It was Vaughan’s idea to design and build an accessible roof garden. “I took a hand-coloured sketch with me to one of the ZinCo seminars hoping to find the correct technical solution for implementing my idea”. And he found it. 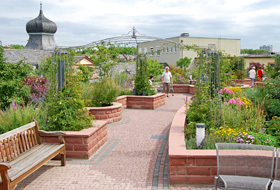 Based on the ZinCo system build-up “Roof garden”, an intensive green roof with walkways, stone walls and raised beds was created in 2001 – in line with Vaughan’s original sketch. 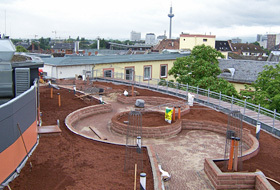 The ongoing building works at the Frankfurt Buergerhospital required that the “Z-Building” be topped up in 2008 by adding two storeys that would accommodate women who have just given birth, new born care and general nursing care. There were consequences for the popular roof garden on the building. As it had worked perfectly for years and was a much-loved and appreciated resource, CEO Wolfgang Heyl and Executive Director, Marcus Amberger decided to re-locate the roof garden. It was then dismantled and re-instated two floors up using an identical design. The proven ZinCo system build-up “Roof garden” was once again in use. 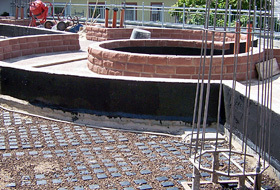 Using as a base a bituminous waterproof membrane that was already root-resistant, the ZinCo system build-up began with protection mat ISM 50, which was followed by the drainage and water retention element Floradrain® FD 60. Once the underlying channel system is installed across the entire roof area it will ensure the run-off of excess water right across the roof, beneath the walkways and around the area of the stone walls. In this case, the Floradrain® elements are “permanent formwork” and filled with concrete, and the red sandstone walls are set in mortar. In those areas that were to be greened, the Floradrain® FD 60 element was filled with the crushed brick substrate Zincolit® Plus and covered with filter sheet SF. The system substrate “Roof garden” was then spread to a depth of about 35 cm and levelled to match the height of the stone walls. The substrate is blown onto the roof easily and efficiently using a silo vehicle. A glorious and particularly wide array of plants is now growing in the raised beds, providing an ever-changing picture that is in bloom the whole year round. The winter Snowball Bush will bloom even in winter. The Osmanthus appeals in the autumn due to its strong scent. Similar to the Lilac bush, it is an example of how this garden appeals to all the senses. Even the sense of touch doesn’t come up short: the small trample path for diabetics with its different surfaces enables you to feel if your feet are warm or cold, hard or soft. The climbing roses are eye catchers and at the same time they are used to cover the exhaust air pipes on the roof, a solution that is both creative and functional. Individual bushes up to 3 m in height such as the Rock Pear set the tone in terms of design. Clematis and evergreen honeysuckle enhance the adjacent façade and complete the over picture of harmony in this roof garden. Thanks to a drip line irrigation system and careful tending by Peter Vaughan, this green paradise wants for nothing. The Buergerhospital Frankfurt is an example of how green space can even be created in built-up areas for use as recreational space. A blossoming attraction that has found a lot of enthusiastic supporters and that contributes without a doubt to the speedy recovery of the patients. By the way, another green area was created in the spring of 2012 on top of the N-Building and its extension. A part intensive and part extensive green roof was installed on an area of about 350 m² – naturally using ZinCo expertise.